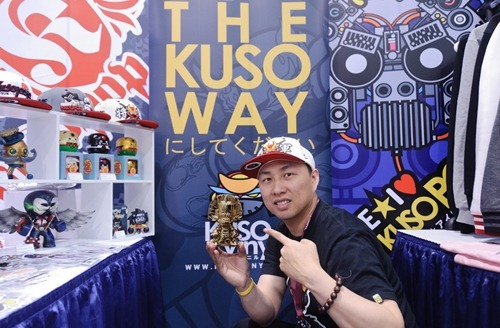 For the second year in a row, Kuso made the trip down from SF to Anaheim for WonderCon. On the Kuso Vinyl side of things, they featured the new golden version of their Luckitty mini-pon from Rotobox, gorgeous electroplated Chrome and Metallic Gold Mictlans from Jesse Hernandez, sweet Fahrenheit customs from Fuller. KusoPop showcased their new merch including laser-cut keychains, new bamboo iPhone cases, wood pendants, and new Tees. While attending Wondercon we got to check out the Beefy Co. booth, which showcased a ton of customs featuring the Bad Bad Buddha figure as a platform. The figure served great as a big chunky piece of vinyl to work on and we are in love with the turn out. For more pictures from the show, take a look after the jump! 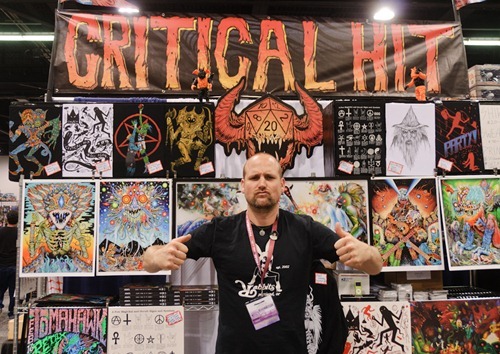 Wild man Skinner set up shop at WonderCon in his Critical Hit booth. For his first solo convention exhibition, he offered a wild collection of numerous large bold and colorful prints featuring barbarians, demons and more. Fans of the Lurker had vinyl toys, mini prints, jewelry and more to choose from. While the booth was focused on 2D art, Skinner created a small edition (3) of custom Fury sofubi for the show as well. Hopefully he’ll continue to exhibit at various show around the country. 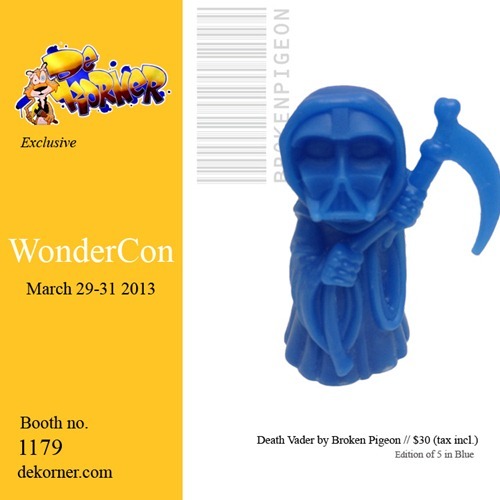 On Friday, DeKorner’s exclusive edition of 5 red Death Vaders by Broken Pigeon sold out quickly. So, the artist spent most of Friday working on additional figures. 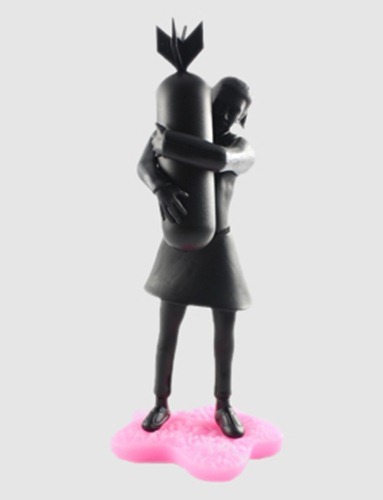 On Saturday, DeKorner will release a black edition (5 pcs). On Sunday, Broken Pigeon will be at the booth from 11 AM to Noon for the release of a blue Easter edition (5 pcs). Both editions will be available for $30 (including tax). Drop by DeKorner’s booth [#1179) to get your Broken Pigeon fix. Nestled in among their various exclusives at their WonderCon booth, DeKorner gave the public the first look at their upcoming exclusive colorway of Scott Tolleson's Raaar! from Dynamite Rex aptly named Dwight. The hand-painted paint master looks great rocking the Purple n' Gold. DeKorner's exclusive is expected in the Fall. 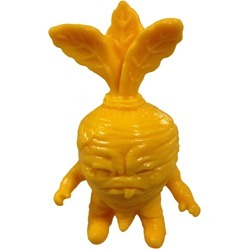 Here’s a look at DeKorner’s WonderCon exclusive Yellow Gummy Deadbeat exclusive from Scott Tolleson, which will be sold with the debut mini-deadbeet pvc figure in yellow. The set will be available for $77 (including tax) on Saturday from Noon to 1 PM during Scott’s signing. The set marks a preview of the mini-deadbeet which will also be released later in the year from October Toys. BAIT will debut both of their exclusive OMFG! sets at WonderCon. They have a translucent purple series 1 edition and a translucent yellow series 2 edition – Go Lakers (yes, I’m loyal to the bitter end). These are the OMFG! characters you love, produced by October Toys with special BAIT header cards. Drop by BAIT’s booth [#1153] to check out these figs as well as their other exclusives including Dave Flores’ Deathshead and the Southern Jaguar Knight by Jesse Hernandez. In addition to their numerous WonderCon exclusives, DeKorner will be offering the new controversial Apologies to Banksy Figures at special ‘con pricing. So if you’re itching to pick up either the Rude Copper (4” for $12, 6” for $24) or the Bomb Hugger (6”, $24) pvc + vinyl toys, this is your chance to do so at roughly 20% off the list price and without having to pay for shipping from the UK. Drop by booth #1179 to check out these street art inspired toys. 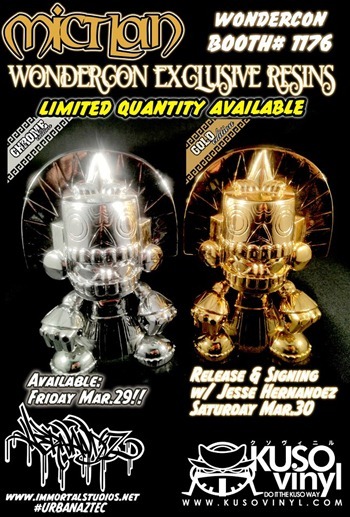 BeeFy and Co. is gearing up for WonderCon with several releases, their ‘So Badass, It’s Good’ Custom Bad Bad Buddha Show’ and a whole weekend of artist signings. For the drops, there’s the Ghost Tribe X Warrior OG edition which will debut at the ‘con. As an advance release, only 40 pieces [ed. of 225] will be available. BeeFy will also release MissyMToyz’ Lil Buddha 6” PolyResin based on her travels and appreciation of the cultures she encountered in the process. With its faux bronze finish, this piece would blend right into a shrine or temple. Each piece is signed and numbered by Marisa. 30 pieces [ed of 500] will be available @ WonderCon. We previously posted early progress shots of several of the custom Bad Bad Buddha figures for BeeFy’s WonderCon custom show. Several artists have posted their final pieces, many of which are extremely nice. Hit the jump for a quick collage of what you’ll see at BeeFy’s booth. If you’re going out to Anaheim for WonderCon, don’t miss BeeFy and Co @ booth #1253. 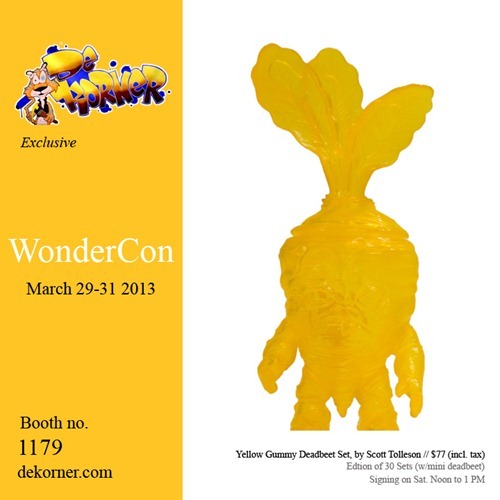 DeKorner will release an exclusive 2 figure Deadbeet set from Scott Tolleson for WonderCon (3.29 – 3.31). The set will feature a yellow full-sized Gummy (translucent) Deadbeet and for the first time ever, a mini pvc deadbeet from October Toys in yellow. The set is a preview of sorts for the new minis which will be released later this year. 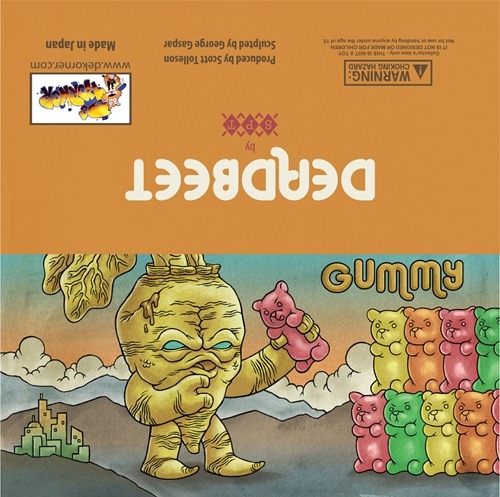 The Gummy Deadbeet is on his way from Japan at the moment, so we don’t have pictures yet. In the meantime, enjoy a peek at the mini pvc deadbeet and Scott’s hilarious header card – love how he does a different one for each drop. Limited to 30 sets, the Deadbeet set will be available for $77 (tax included) at the DeKorner booth [#1179]. Scott will be signing from Noon to 1 PM on Saturday (3.30). 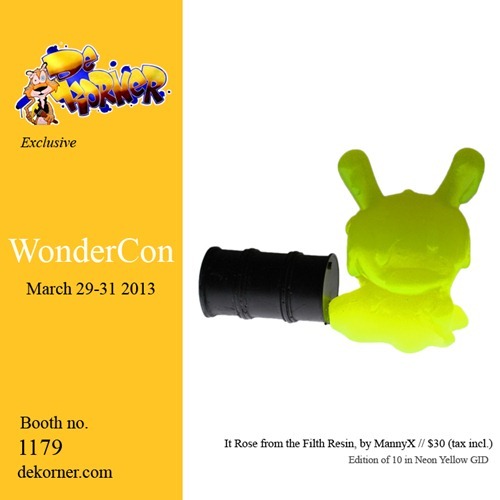 For WonderCon, DeKorner will be offering two exclusives from MannyX. The first is a Neon Yellow GID w/black oil barrel version of his ‘It Rose from the Filth’ resin (10 pcs, $30 including tax). Keeping with the GID theme is Manny’s 'Radioactive Spill’ Android custom in Black with Neon Yellow GID radioactive goop (5 pcs, $50 including tax). Be sure to check out DeKorner’s booth at the ‘con [#1179]. 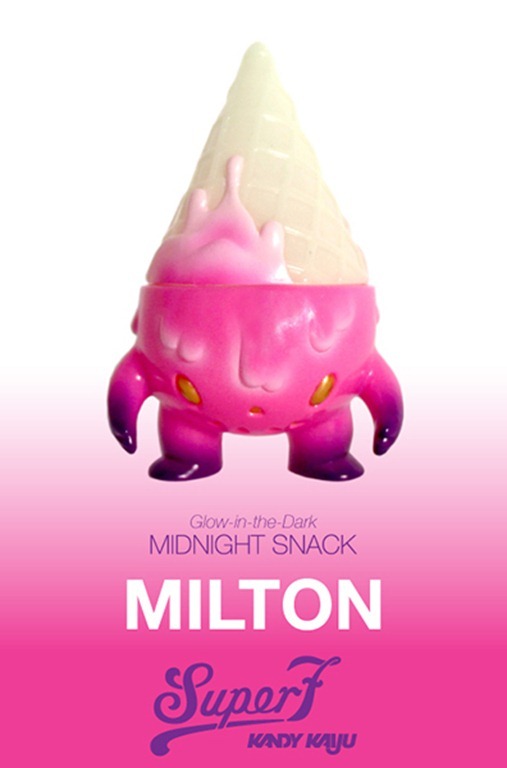 Dan Goodsell will be at Wondercon with two new creations from the Mr. Toast universe. 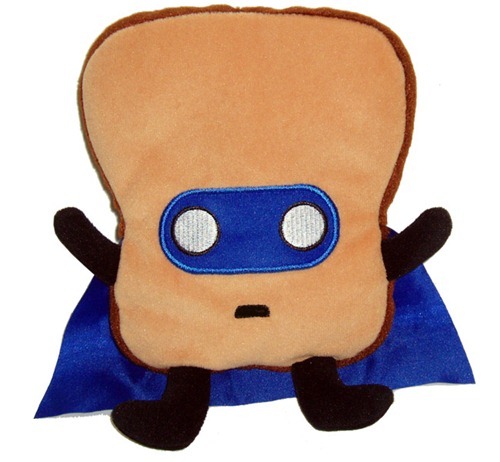 First is the heroic Midnight Super Toast Plush (200 pcs w/hand numbered tag, 7”, $10). Dig the cape! Next up is the new Shaky Bacon Resin sculpted by Pretty in Plastic and hand-painted by Dan himself (45 pieces, 5”, $45). All of this and more will be at the Mr. Toast booth [#1168]. Here we have an update on the release of Jesse Hernandez’s Chrome and Gold Mictlan figures, last seen HERE. They will each be limited to only 15 pieces, with the Chrome edition dropping on Friday and the Gold dropping on Saturday. They both come unequipped with staff and will retail $130 each. Jesse will be at the booth #1176 on Saturday, March 30th at 11AM signing. Super7 will be making it down from San Francisco to once again to attend Wondercon this year. With them, they’ve got a handful of cute tiny sofubi figures or your collecting pleasures. 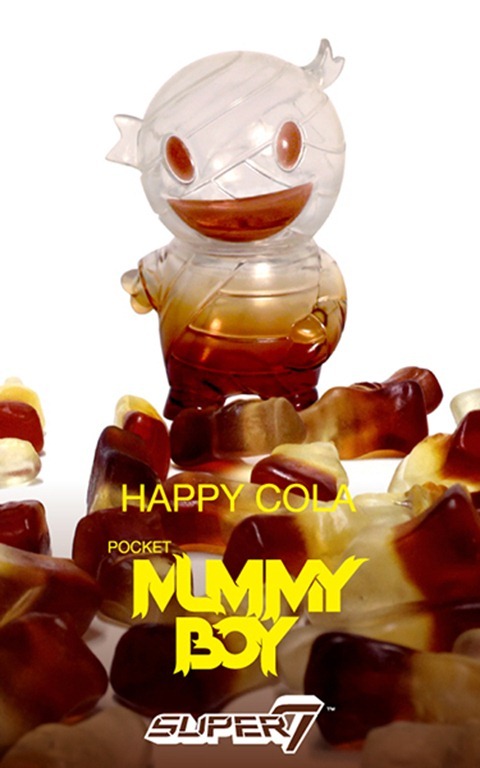 First up is the Happy Cola Pocket Mummy Boy, which immediately screams that cola candy we all know and love. 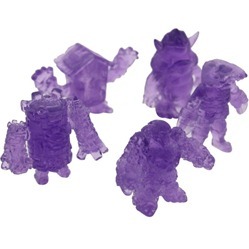 This release features a squishy clear vinyl made to replicate the feel of the candy, as well as a brown sprays. 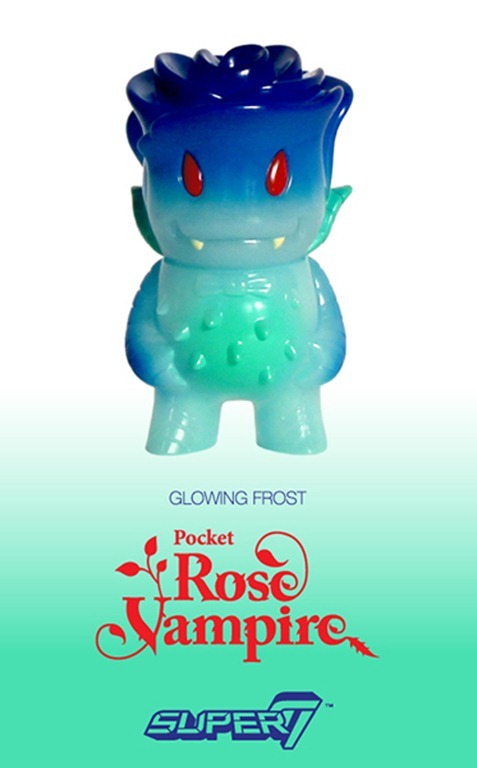 Second up is the Glowing Frost Pocket Rose Vampire, which is cast in a GID vinyl with blue and red sprays. Last up is the Midnight Snack Milton, who is also cast in a GID vinyl with pink, purple, and gold spray. All of these figures will be on sale at the S7 booth #1166 for $25 each. 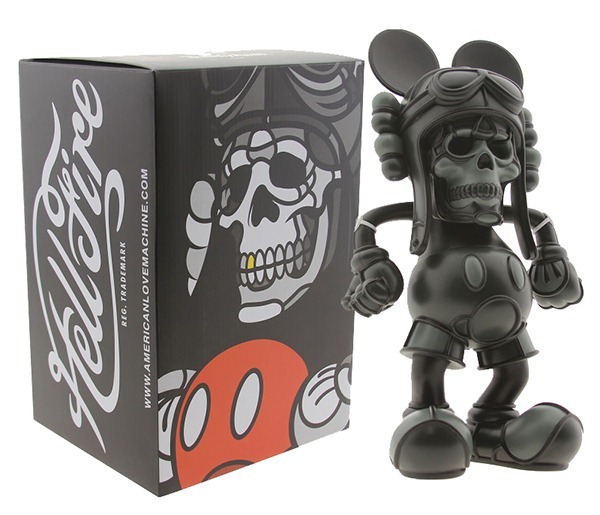 BAIT has got a hold on another fresh Wondercon Exclusive drop for you all! Take a look at their exclusive Dark GreenDeathshead figure by David Flores. This is a run of only 30 pieces and will retail $100 each and should go fairly quickly. Find em’ at booth #1153. What’s better than a happy Yellow Lucky Cat Android ? How about a figure + print set? 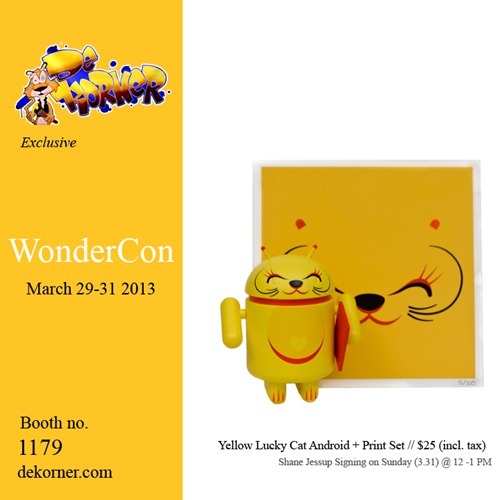 For WonderCon (3.29 – 3.31), DeKorner will offer an exclusive set featuring the Yellow Lucky Cat Android and matching 5” mini-print (edition of 50). The set will be available @ DeKorner’s booth [#1179] for $25 (tax included). The exclusive yellow print will also be available to collectors who purchase three or more Lucky Cat Androids from DeKorner. Series designer Shane Jessup will be signing at the booth on Sunday (3.31) from Noon to 1 PM PDT. 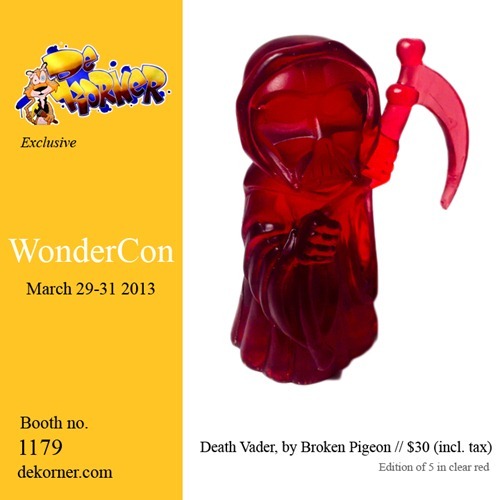 As part of their WonderCon (3.29-3.31) llineup, DeKorner will release an exclusive clear red edition of Broken Pigeon’s Death Vader resin. The piece combines the grim reaper motiff with the most infamous Lord of the Sith. Limited to 5 pieces, the 3.5” figure will be available for $30 (includes tax) from DeKorner’s booth [#1179]. 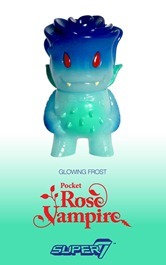 For WonderCon (11.29 - 11.31), Kuso Vinyl will release their exclusive Gold Luckitty Pon (3", 200 pcs, $11) from Rotobox. Following the OG White and the recent Black Japan editions, this golden cat will bring you immense wealth, at least according to the tradition. Scoop up your good fortune @ Kuso's booth [#1176].